^ Born on 28 September 1823: Alexandre Cabanel, French academic painter who died on 23 January 1889.  French painter and teacher. His skill in drawing was apparently evident by the age of 11. His father could not afford his training, but in 1839 his d�partement gave him a grant to go to Paris. This enabled him to register at the Ecole des Beaux-Arts the following October as a student of Fran�ois-Édouard Picot. At his first Salon in 1843 he presented Agony in the Garden and won second place in the Prix de Rome competition (after L�on B�nouville, also a student of Picot) in 1845 with Christ at the Praetorium . Both Cabanel and B�nouville were able to go to Rome, as there was a vacancy from the previous year. Cabanel�s Death of Moses, an academic composition, painted to comply with the regulations of the Ecole de Rome, was exhibited at the Salon of 1852. The pictures he painted for Alfred Bruyas, his chief patron at this time (and, like Cabanel, a native of Montpellier), showed more clearly the direction his art had taken during his stay in Italy. Albayd�, Angel of the Evening, Chiarruccia and Velleda were the first of many mysterious or tragic heroines painted by Cabanel and show his taste for the elegiac types and suave finish of the Florentine Mannerists. On Cabanel�s return to Paris, the architect Jean-Baptiste Cic�ron Lesueur [1794-1883] commissioned him to decorate 12 pendentives in the Salon des Caryatides in the H�tel de Ville (destroyed in 1871). Several major decorative commissions followed, which included work on the H�tel Pereire, the H�tel Say and the Louvre. Much has been destroyed, but the ceiling in the Cabinet des Dessins in the Louvre, The Triumph of Flora, which combines the hard contours and careful finish of Ingres�s school with a composition and color that recalls the ceilings of the French Rococo, is probably typical of Cabanel�s talent for achieving sumptuous effects. In 1855 Cabanel exhibited Christian Martyr, Glorification of St Louis and Autumn Evening, establishing his academic and official credentials. In 1855 he received the L�gion d�honneur and in 1863 he was elected to the Institut and nominated professor (along with Jean-L�on G�r�me and Isidore-Alexandre-Augustin Pils) at the reorganized Ecole des Beaux-Arts in Paris. He won the Grande M�daille d�Honneur at the Salons of 1865, 1867 and 1878. His dark-eyed heroines, thinly painted, usually in muted colors, and immaculately drawn, were popular with collectors on both sides of the Atlantic; likewise his mythological paintings, which were a by-product of his decorative works. 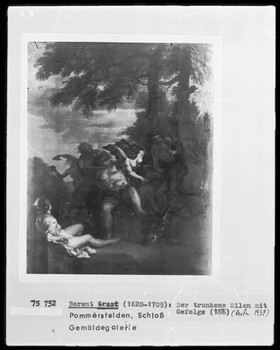 Nymph Abducted by a Faun (1860) is a solid, decorative group in the manner of Charles Coypel or Fran�ois Lemoyne. He exhibited the Birth of Venus (1862) in 1863 to widespread acclaim. It is composed like an overdoor by Boucher, although it has been suggested that it was influenced by Ingres�s Odalisque and her Slave (1839). Both paintings were acquired by Napoléon III. In 1867 he painted a huge Paradise Lost for Ludwig II, the King of Bavaria, and in 1868 Ruth for the Empress Eug�nie. The full-length portrait of the Emperor that Cabanel painted for the Tuileries in 1865 was liked by critics less than Hippolyte Flandrin�s dreamy portrait exhibited in 1863 (1860), but it was much more popular at court. Cabanel�s portraits were already in demand, and he rivalled Édouard Dubufe and Franz Xavier Winterhalter as portrait painter to the Napoleonic aristocracy. He was elected regularly to the Salon jury, and his students could be counted by the hundred at the Salons. Through them, Cabanel did more than any other artist of his generation to form the character of 'belle �poque' French painting. Cabanel�s pictures were always drawn and painted with a high degree of academic virtuosity, combined with an undercurrent of strong feeling, as in the Death of Francesca da Rimini and Paolo Malatesta (1870). This made him popular in his lifetime, but it was the wrong combination for the tastes of later generations. After his death his reputation collapsed. .
— Cabanel was a successful teacher. His students (like those of his master, François-Édouard Picot) often won the Prix de Rome. Among them were Henri Regnault, Jules Bastien-Lepage, Fernand Cormon, Édouard Debat-Ponsan, Émile Friant, Henri Gervex, Thomas Hovenden, Eugene Vail [29 Sep 1847 – 28 Dec 1934], Édouard Th�ophile Blanchard [1844-1879], Lodewijk Royer.  The Birth of Venus (1863, 132x229cm _ ZOOM to 1400x2417pix) _ This painting was exhibited in 1863 and was bought by the Emperor Napoléon III. — Ophelia (1883, 77x117cm; 771x1195pix, 189kb) _ .detail (960x1280pix, 120kb) enlarged close-up of Ophelia as shown here >>>.  Fallen Angel _ In Christianity (as in Judaism and in Islam), the angels of Hell, or dark angels, or demons, or devils, or fallen angels, are the evil counterpart of the heavenly host. The chief of them, Satan (or Lucifer), was cast out of heaven for leading a revolt. They are often viewed as the initiators of evil temptations. Famous literary treatments of angels are those in Paradise Lost of John Milton [1608 – 08 Nov 1674] and in La Divina Commedia of Dante Alighieri [1265-1321]. ^ Died on 28 September 1899: Giovanni Segantini, Italian Art Nouveau painter and draftsman born on 15 January 1858. An exponent of divisionism, he was the only Italian painter of the late 19th century to have enjoyed an unbroken international reputation, especially in Germany and Austria.  Segantini was orphaned when he was only eight years old and spent the rest of his childhood with relatives in Milan. As a young man Segantini lived on the proceedings of his decorative work while taking evening class in ornamental and decorative painting. About 1880 he was discovered by the art dealer Vittore Grubicy de Dragon who sponsored his participation in local and international exhibitions. Segantini became particularly well known in Germany and in 1896 had a one-man show in Munich. He was much admired by artists such as Munch, Van Gogh and Ensor. The famous abstract artist Kandinsky characterised Segantini as one of the forerunners of spirituality in art. 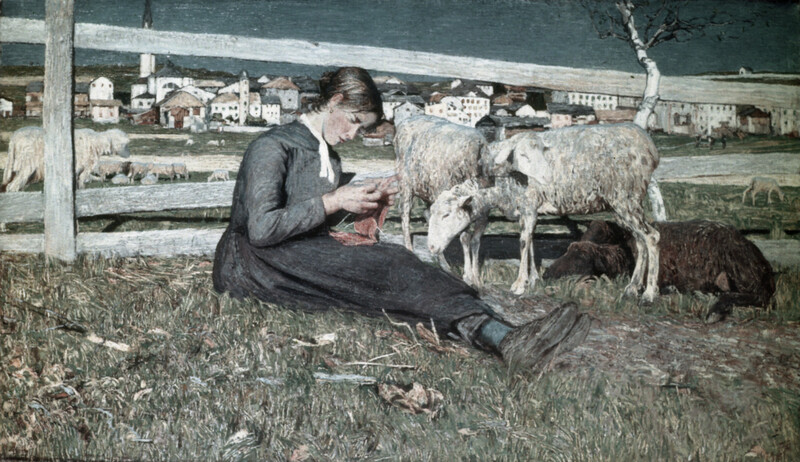 Segantini's early work comprised of idyllic rural scenes painted outdoors. Later on Segantini was encouraged by Vittore Grubicy to paint with the Divisionist technique. The primary concern of this technique was the question of how the eyes saw light; the separation, juxtaposition and overlaying of colors on the canvas was aimed to reproduce the luminous vibrations of rays which make up light. Like other painters, Segantini used Divisionism to suggest certain mystical qualities and to intensify a spectator's emotional response by enhancing the luminous quality of the scene. The art critic and dealer Vittore Grubicy worked tirelessly to convince both the public and those in charge of government cultural policy that the artists practicing the Divisionist technique were showing a new direction for art. Divisionism emerged at a time when Italian politics was characterised by an anxiety to promote a new national consciousness. The President of Italy Pasquale Villari, elected in 1896, stressed the importance of a national pride and warned against uncontrolled emigration. 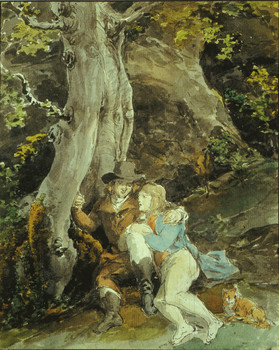 Yet the Divisionist technique was met with a degree of scepticism because it contradicted the traditional notions of the representation of the natural world. At the most extreme the paintings produced were considered the product of a diseased retina. The artists who painted in a Divisionist style were viewed as suffering from hysteria as well as diseases of the eye. –- Punishment of Lust (1891, 99x173cm; 718x1270pix, 88kb — .ZOOM to 1593x2835pix, 3437kb) _ This painting is based on a Buddhist poem about women who reject the duties of motherhood, and is one of a series of disturbing Segantini paintings on this theme. The floating figures represent the souls of women who have had abortions, and are being forced to travel through an icy valley as punishment. Cold temperature suggests the opposite of passion, usually associated with heat. The snowy landscape is based on the Swiss Alps, where Segantini spent much of his life. — Artists have often imagined dramatic, violent weather as a fitting punishment for wrong doing. But here, the Italian artist Giovanni Segantini creates a punitive, purging weather effect that's very unexpected. Inspired by a Buddhist poem describing the passage of dead souls on their way to Nirvana, this image depicts the floating spirits of women who have been guilty of lust. In direct contrast to the heat of their passions during life, the punishment of these spirits is a long passage through a mountain landscape covered with snow, where the weather is still, silent and extremely cold. 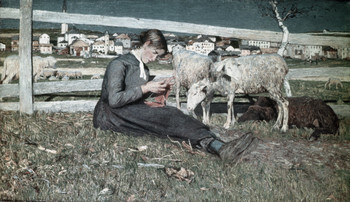 Segantini's attitude to women was common among men, and even women in his time, who firmly believed that women should stay at home and look after the children. But the profoundly unsettling imagery of this picture, set in the Swiss Alps where Segantini lived, was also informed by a private tragedy. The artist had lost his own mother when he was seven and he later found himself particularly affected and disturbed by the idea of women who abandon their children. Possibly unable to reconcile himself to his own loss, he made a number of works where bad mothers and uncaring women are tormented. In this picture a barren tree has caught the long flowing hair of one of the women in its branches. It's as if even the landscape itself cannot bear to see these unnatural creatures pass without extracting some revenge. — The Punishment of Lust belongs to a series of paintings produced between 1891 and 1896 on the theme of cattive madri. Segantini was inspired by Nirvana, a poem written by the 12th century monk Luigi Illica in imitation of the Indian text Panghiavahli. Illica's poem contained the phrase 'la Mala Madre' (reminiscent of 'la mala femmina' or prostitute) to describe those women who refused the responsibilities of motherhood. The souls of the women are depicted floating against a snowy background based on the Swiss Alps where Segantini spent much of his life. 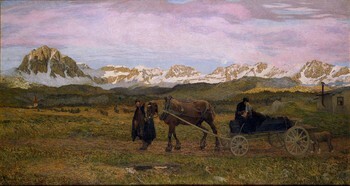 The grandeur and spirituality of the Alps must have been a constant inspiration to Segantini whose last words before he died are recorded to have been: "I want to see my mountains". In the painting the spirits of the women are punished for having committed the sin of abortion consciously or by neglect. Segantini had lost his mother when he was seven years old and was probably passionate to represent the trauma of the mother for the loss of her child. Segantini believed that a woman's role in life was motherhood and that a woman who objects to this role was mean, bad or selfish. His beliefs drew from both religious and metaphysical ideas: the sanctity and motherhood of the Virgin Mary combined with the fertility of nature. The tree in this series of paintings is a religious symbol of the tree of life which, although bare and dead in the winter, will be reborn and blossom in the spring. Segantini came from a country shaped by catholicism. Although in his private life he never conformed to catholic doctrine, for example he refused to marry his partner and mother of his four children, his work was strongly influenced by religious ideas. What may have attracted Segantini to religion may have been the hope for a life after death. Indeed in another painting from the same series, L'Angelo della Vita (1894) the mother has the pose of the Madonna bending lovingly over the baby, while in the mountain landscape the snows have melted and the birch tree is bringing forth young shoots. The painting is connected with the Christian tradition of redemption. The poem Nirvana which inspired the painter also suggests the possibility of regeneration: the bad mother may eventually find her natural instincts blossoming again, just as an apparently dead wintry tree will bring forth leaves as the season moves towards spring. Despite the tragic theme of the painting the overall effect and feeling achieved by the thread-like brushstrokes of Segantini is very atmospheric and dreamy. 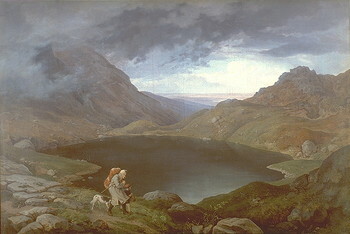 The mysterious atmosphere set by the painting is in line with the painter's metaphysical views about the connection between human and natural life. ^ Born on 28 September 1920: Alan Davie, Scottish painter and printmaker. — He got trained as a painter at Edinburgh College of Art from 1938 to 1940, initially favoring poetic imagery and coming into contact with modernism at London exhibitions of works by Picasso (1945) and Paul Klee (1945). He explored a diverse range of activities, however, before returning to painting: from 1949 to 1953 he earned his living by making jewelry and in 1947 he worked as a jazz musician, an activity he continued in later life. He wrote poetry during the early 1940s. From 1947 to 1949 Davie traveled extensively in Europe; in Italy he studied pre-Renaissance art and saw a wide range of modern art, including the Peggy Guggenheim collection in Venice, to which he later continued to have access. Among the works owned by Guggenheim were paintings of the early 1940s by Jackson Pollock, which led Davie to adopt mythic imagery and forceful painterly gestures. He also adopted from later Pollock a procedure of painting rapidly with his canvases on the floor. From this time his pictures concentrated on themes of organic generation and sinister ritual, fluctuating between turbulent paintwork, animate presences and more geometric forms, sometimes in the same work, as in Golden Seam (1952). From 1953 to 1956 Davie taught in London at the Central School of Arts and Crafts, where he became interested in African and Pacific art. Encouraged by his critical and commercial success from the mid-1950s and by the large studio space made available to him during his Gregory Fellowship at Leeds University (1956�9), Davie increased his scale in works such as The Creation of Man, or Marriage Feast (1957, 213�366cm). With its teeming animal, human and pictographic forms, this triptych exemplifies Davie's search for a proliferation of painted signs and images, which bore more of an affinity to artists of the Cobra group such as Asger Jorn than to American Abstract Expressionism. Influenced by his reading of Eugene Herrigel's Zen in the Art of Archery (1953) in 1955, Davie became interested in Zen Buddhism and concluded that conscious decision-making was incompatible with a spiritual quest; as a result he rejected the emphasis on existential choice and immediate emotionalism central to Harold Rosenberg's definition of action painting. As early as 1958 Davie emphasized the importance in his work of intuition, as expressed in the form of enigmatic signs. During the 1960s, both in paintings and in colored lithographs, he represented such images with increasing clarity at the expense of gestural handling. From 1967 to 1971 he worked intermittently on a Berlin school mural involving an angled wall; he later introduced more representations of room-like spaces with zigzagging walls into his paintings. In 1971 he made his first visit to the island of St. Lucia, where he began to spend half of each year and which brought Caribbean influences to bear on his suggestive imagery, as in Bird Gong No. 10, Opus 730 (1973). Taking on the role of a disinherited shaman, Davie created a synthesis of mythologies from a variety of cultures for a modern civilization devoid of its own village myths. _ The Birth of Venus (or whatever) (1636, 97x108cm; 311x400pix, 28kb) by Poussin [1594-1665]. — Entrance for a Red Temple No. 1 (1960, 213x173cm) _ In his early work Davie had accessed a higher level of consciousness through spontaneous or automatic painting. By the 1960s, as in this painting, he referred to this higher state by including emblems and signs associated with Zen Buddhism and magic. This picture went through countless transformations before arriving at its final state. These hidden layers can be seen throughout the picture, perhaps suggesting levels of consciousness. Davie has described the picture as �an immobile and timeless frontal object of meditation, or an evocative invitation to enter, like the entrance to a place of worship�. ^ >Born on 28 September 1855: George de Forest Brush, US painter who died on 24 April 1941. — He began his formal training at the National Academy of Design in New York and in 1873 entered the atelier of Jean-L�on G�r�me in Paris, studying there and at the Ecole des Beaux-Arts for almost six years. Soon after his return to the USA in 1880, he was elected to the Society of American Artists. Thereafter he spent much time on both sides of the Atlantic, beginning in the US West and including lengthy stays in Paris, Florence, New York, and Dublin NH, where he purchased a farm in 1901.  Although some may think of US painting about 1900 as dominated by Impressionism, this was actually one of the most diverse periods in the history of US art. Realists like Winslow Homer and Thomas Eakins, visionaries like Albert Pinkham Ryder, and a wide variety of still-life and landscape painters all reached the height of their powers at the same time as John Singer Sargent, Mary Cassatt, and the members of The Ten. As US painters matured, so too did US sculptors and architects: Augustus Saint Gaudens, Stanford White, and Louis Sullivan appeared in the same generation, as did Walt Whitman, William Dean Howells, and Henry Adams, giving fresh impetus to US letters. It was thus with reason that, in the decades between the nation's Centennial and 1900, the cultural leaders of the age thought of themselves as participating in an artistic revitalization, as belonging to a US Renaissance. Within this creative ferment there were some painters who inclined towards a more literal emulation of Italian Renaissance art, as that art was filtered through the academic teaching and example of their mentors at the École des Beaux-Arts in Paris. Among the many young Americans who deliberately sought such instruction was George deForest Brush, the son of a successful Connecticut businessman. Brush first encountered the systematic artistic professionalism of the French Academy through his teacher at the National Academy of Design, Lemuel Wilmarth. In 1874, Brush went to Paris and placed himself under the tutelage of Jean-Léon Gérôme (1824~1904), one of France's most illustrious art teachers, who demanded the close study of the human form and instilled a spirit of romance in his students through his preference for exotic subjects drawn both from the classical past and from the contemporary Near East. After completing his studies and returning to the United States in 1880, Brush began to paint his own exotic romances as he saw them embodied in the anatomical perfection and noble ideals of the Amerindian. By the late 1880s, Brush began to move away from the Amerindian subjects that had first won him fame towards elegantly composed and painted images of mothers and children, based on the madonnas of the High Renaissance. His wife Mittie and his blond haired brood of one son and six daughters served as his models. In 1898 Brush embarked on the first of a long series of visits to Florence. _ Thea (1910, 41x30cm), a portrait of his youngest daughter, born in Florence in 1903. Thea, later Mrs. Thomas Handasyd Cabot, is depicted as a girl of about seven or eight, carefully posed in a fanciful costume completely dominated by a large red hat. Her long, blond tresses fall like watered silk across the front of her green velvet dress, whose lace collar and embroidered sleeves complement the hat's feathery plumes in their delicacy. The painting's oval format and ornately-carved frame suggest the artist's Renaissance preoccupations. From the time of his first Italian visit, Brush had made a study of Renaissance painting techniques, grinding his own pigments and applying them to carefully prepared gesso grounds to recreate the luxuriant colors of sixteenth and seventeenth century Italian painting. As much as it is a portrait of a disarming young lady, Thea is also an essay in those colors, one whose principal intent is to evoke its Old Master prototypes.  Although George Brush was best known for his sensitive portraits of mothers and children, his paintings of Amerindians helped launch his highly successful career. After studying for six years at the École des Beaux-Arts, Paris and with the famed academic painter Jean-L�on G�r�me, Brush traveled extensively in the West between 1881 and 1885. _ The Sculptor and the King (1888, 51x91cm) they had become romantic idealizations. Here he combined Mayan architectural motifs, such as a wall relief, with objects from other Amerindian cultures in other times. The classic composition, subtle tonalities, and meticulous brushwork of The Sculptor and the King won him the coveted Julius Hallgarten Prize in 1888. — Forest Brush Smoking (photo, 208x300pix, 17kb). — Forest Brush Not Smoking Nor Doing Anything Else, Other Than Sitting and Staring at the Camera (photo, 416x340pix, 29kb). _ This Forest Brush is NOT Forest Brush (2008; 1175x1704pix, 407kb). –- The Indian and the Lily (1887, 53x51cm; 1198x1128pix, 94kb) _ In 1881, young George de Forest Brush traveled west with his brother to the Crow reservation in Montana. While there, Brush documented all aspects of Amerindian life and, according to a first-hand account, immersed himself in Amerindian culture, participating in and at times leading ritualistic ceremonies and dances. Chief Plenty Coups allegedly said that Brush was the “only White man who could walk and think like an Indian.” Based on his four or five year sojourn out west, Brush painted a series of works depicting life on the Crow and other reservations, some of which were featured as illustrations in Harper’s and The Century Magazine. Unlike chroniclers of the US West such as George Catlin and Karl Bodmer, Brush progressively adopted a more idealistic approach. In 1885 the artist wrote, “In choosing Indians as subjects for art, I do not paint from the historian’s or the antiquary’s point of view; I do not care to represent them in any curious habits which could not be comprehended by us; I am interested in those habits and deeds in which we have feelings in common. Therefore, I hesitate to add any interest here to my pictures by supplying historical facts. If I were required to resort to this in order to bring out the poetry, I would drop the subject at once”. Painted in Florida in 1887 and exhibited at Chicago’s Columbia Exposition in 1893, The Indian and the Lily, which depicts a Seminole, is one of Brush’s most renowned Amerindian paintings and reveals the artist’s unique methodology, which distinguished his work from that of his fellow artists. Brush presented the Amerindian from a viewpoint quite different from any of his predecessors. His paintings were not directly concerned with warfare, ceremonial display or the more sensational aspects of primitive life, but rather they were interpretations of the philosophy of the Amerindian. He was the poet of US Amerindian painters. Brush’s reputation was rooted in part in his formal artistic training. At the age of nineteen, he won a scholarship to study with Jean-Léon Gérôme at the École des Beaux Arts in Paris. Gérôme’s studio, one of two leading schools in Paris at the end of the 19th century, emphasized study of the Old Masters, a careful attention to anatomy, and painstaking preliminary drawing. Armed with this influential artistic training, Brush adopted a classical approach to his Amerindian paintings whose figures of anatomical splendor are often based on the Greek ideal. In addition, Brush, like Gérôme, had a vast collection of costumes, objects and decorations, which he relied upon when he returned east, and which enabled him to paint in exacting detail. The themes of death and regeneration, symbolized by the swan and the lily, the Seminole’s empathetic gesture and chiseled physique, embody Brush’s iconic blend of stylistic classicism and ideological romanticism. The Seminole’s hand reaching out to the lily lightly quotes the Renaissance iconography of Adam’s hand reaching out to God on Michelangelo’s Sistine Chapel ceiling; and the nobility of the Seminole as he contemplates the lily evokes not only the profound sympathy for nature Brush observed in his study of native cultures, but also his own mythical and stoic perception of the Amerindian. In these Amerindian pictures, far too few in number, the imagination revealed is deep and elevated, and no one has approached him in the completeness with which he has suggested the solemn romance of these primitive conditions. About 1890, after painting a very limited number of Amerindian subjects over an approximately ten year period, Brush shifted his focus to domestic portraits of mothers and children based on the traditional religious grouping of the Madonna and Child. While several possibilities for this change in direction have been postured, his daughter, Thea Cabot suggested that her father, true to his character and idealism, stopped representing Amerindians because, “he was heartbroken about how the Indians were treated by the government, how they had been cheated of everything…These Indians were his friends and after seeing what happened to them, he couldn’t paint them anymore” Although Brush never returned to his romantic portrayals of Amerindians, these remain his most renowned and highly sought after paintings. 1892 Stanislas~Victor~�douard L�pine, French painter born (full coverage) on 03 October 1835. ^ 1881 Josef Lauer, Austrian painter born in 1818. ^ 1875 Thomas Ender, Austrian painter active in Brazil, born on 04 (03?) November 1793. He studied at the Akademie der Bildenden K�nste in Vienna, where from the start he was interested in recording landscape, especially in watercolor. As a prot�g� of Chancellor Metternich he was appointed artist to the Austrian scientific mission that left for Brazil in 1817 accompanying Dona Leopoldine, the Archduchess of Austria and the Imperial Brazilian princess. During his ten-month stay in Brazil, spent mainly in Rio de Janeiro, S�o Paulo and in trips between the two cities, he depicted landscapes, people, architecture, everyday implements and the flora and fauna of the region in nearly 800 watercolors and drawings. Careful detail outweighs the intrusion of a certain exoticism in these works, as can be seen, for example, in Guanabara Bay (1817). 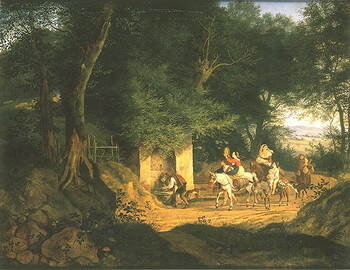 On his return to Austria, and after a sightseeing and study trip through Italy, he became professor of landscape painting in the Akademie der Bildenden K�nste in Vienna from 1836 to 1851. ^ 1688 Giovanni-Battista Beinaschi (or Benaschi), Italian painter, engraver, and draftsman, born in 1636. He studied under Esprit Grandjean (fl 1642�1655), a painter working at the court of Savoy in Turin from 1642, and won the protection of Christina, Duchess of Savoy [1606�1663]. By 1652 Beinaschi had settled in Rome. This date appears on the engraving he made of Giovanni Domenico Cerrini�s Rest on the Flight into Egypt. As a student of the engraver Pietro del P� [1610�1692], Beinaschi made copies after Annibale Carracci�s frescoes in the Galleria Farnese, Rome, after Giovanni Lanfranco�s frescoes in San Andrea della Valle and San Carlo ai Catinari, and after the Classical sculptures in the Belvedere in the Vatican. Beinaschi was deeply attracted by Lanfranco�s illusionism, and it seems likely that he made a trip to Parma to study the frescoed domes executed by Correggio (de Dominici). His earliest works, the Saint John the Baptist Preaching in the Desert and The Holy Family, are indebted to the classicizing tendencies of his training with del P�, yet touched with Baroque vigor. From Cerrini, whose friend and engraver he was, Beinaschi learnt an energetic style of modeling, the rendering of shadowed faces in the background and the handling of light in landscape. He shared an interest in Lanfranco with Giacinto Brandi, and their styles became so close that their works have at times been confused. 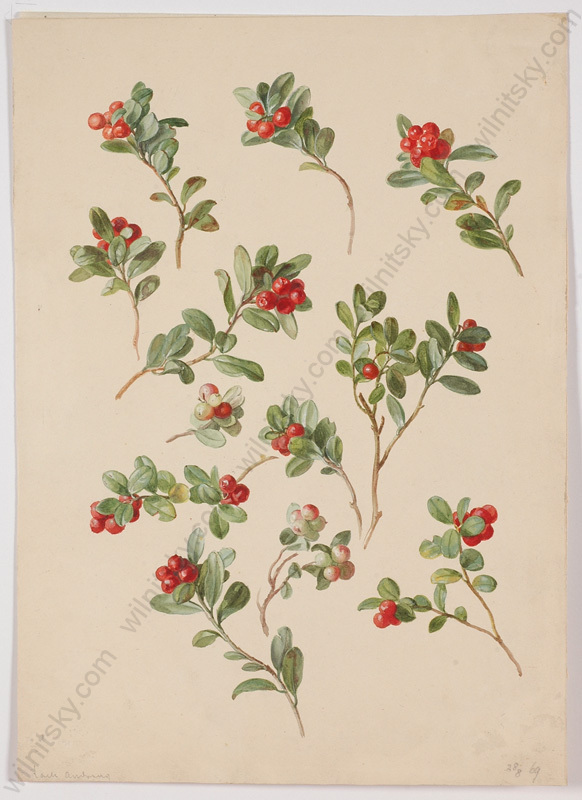 ^ 1877 Mabel May Woodward, US artist who died in 1945. 1876 Richard Hayley Lever, US painter who died in 1958. — A Preying Lion (21x36cm) not to be confused with a Praying Lion. ^ 1862 Anshelm Leonhard Schultzberg, Swedish painter who died in 1945. ^ 1803 Ludwig Adrian Richter, German painter, printmaker, and illustrator, who died on 19 June 1884. He ranks with Moritz von Schwind as the most important representative of late Romantic painting and printmaking in Germany. 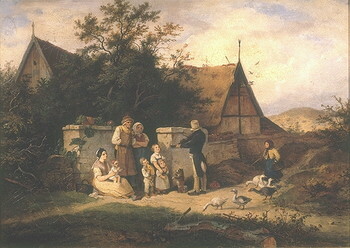 In contrast to the work of such leading masters of early Romanticism as Philipp Otto Runge and Caspar David Friedrich, which was ambitious in content and innovative in form, Richter�s art was more modest in its aims, in line with the restrained intellectual climate of the Biedermeier period. — Heinrich Dreber was a student of Richter. 1628 (21 Sep?) Barend (or Barent) Graat (or Graet), Amsterdam painter and draftsman who died on 04 November 1709. At the age of 16 he was apprenticed to his uncle �Master Hans�, an animal painter, under whom he studied for six to seven years. He spent his entire career in Amsterdam. At first he painted landscapes with cattle in the style of Pieter van Laer, but his best works are either domestic interiors or history paintings with figures, or full-length group portraits set in a landscape or interior. These small paintings (e.g. Family in a Landscape) required considerable technical dexterity. Despite the fact that Graat�s work is of an excellent standard, he received little recognition. Consequently, his paintings have been sold under the name of better-known artists such as Gerard ter Borch II, with whose work his own has much in common. –-S#> Family in a Classical Garden (121x110cm; _ ZOOM to 1440x1300pix, 301kb) The parents are standing, while their two young girls are playing with a goat, a lamb, and a sheep. 1597 Justus (Josse) Susterman (or Soetermans), Flemish artist who died on 23 April 1681. � Leopoldo de' Medici [16 Nov 1617 � 10 Nov 1675] (350x420pix, 8kb) He was made a cardinal on 12 December 1667, before he received even minor orders. 1573 Michelangelo Merisi �Caravaggio�, Italian painter who died (full coverage) on 18 July 1610.